Welcome to the Boat Bar in Bangrak. Hostess and Owner Natnicha would like to welcome you to The Boat Bar & Restaurant. 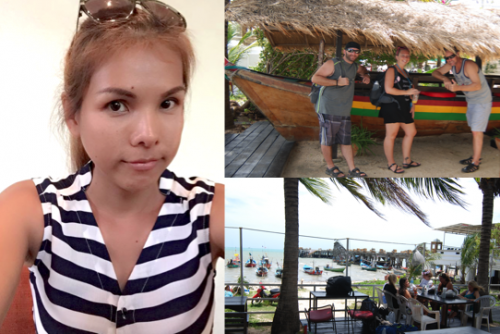 We are located next to the Seatran Pier in Bangrak and we serve tourists with nice cold drinks and lovely food before or after their visits to other island destinations. Please visit us, we are only happy to serve your needs. We serve Thai, European seafood and we are the local destination for breakfast. Food can be ordered at anytime during our opening hours and drinks from our inside boat bar. You can sit inside at the front of the bar or at the back overlooking the water and the boats. At dusk you can sit and take in some of the beautiful sunsets we have in Koh Samui whilst enjoying a cocktail or cold beer. 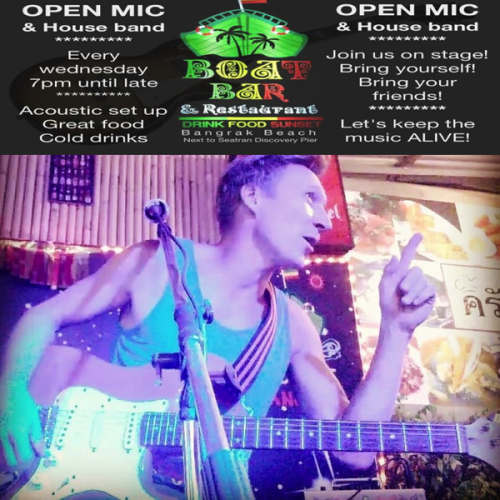 The Boat Bar comes alive with the sounds of Electric and Acoustic Guitars, Keyboards, Drums and Vocals from the many varied performers that attend the Open Mike sessions held every Wednesday Night. Musicians are welcome to come along and join the regular visitors for some great live music. Great local Food, great local prices. Last year we spent Songkran at this bar which was an absolute hoot, great hospitality and food. This year we’ve passed this bar many times on the way to or from a night out and keep saying we must stop by. Well we have and wished we’d done earlier. What a great place. Extensive menu from breakfasts / brunch / dinner or snacks. All excellent prices ( our meal for 3 adults including a few drinks was well sub 1000bht). Not that cost should dictate quality, the food was very good. Green curry, Pad Thai and seafood pineapple rice all very tasty and good portions. Drinks are priced well too and plentiful. Service very attentive and welcoming. They have band nights but not when we visited but was countered by decent hard and soft reggae music. Review from Trip Advisor............ MAHGRob London.